Chen started his career as a darkroom apprentice in 1944, after he was expelled from a leading middle school in Yangzhou, Jiangsu Province, for failing to learn Japanese well during the occupation of Japanese invaders. Two years later he went to work at a big photo studio in Nanjing. He came into contact with many famous people, including artist Chang Dai-chien (Zhang Daqian), and Yang Yanxiu - one of the leaders of the Communist Party of China. "I did a lot of leg work for them," he says. Between 1948 and 1949, he worked in Hong Kong and Taiwan for the then famous Hong Kong Daguangming Film Company and received training in retouching film, or editing photos. He returned to the mainland in July 1950, from Hong Kong, and joined the photo department of the national news agency Xinhua, to become a leading figure in photo processing. 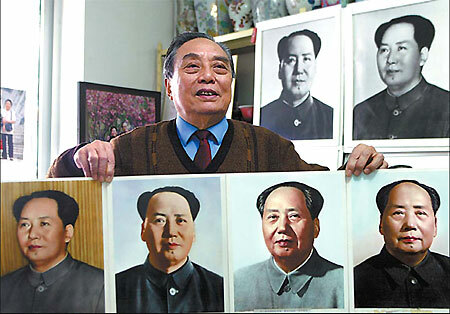 He retouched the four official portraits of Mao. The first one was cut out from a group photo taken in 1950, when Mao posed for photos with a group of model workers. "I scraped out the figure over his shoulder and drew curtains as a background." This became the first official portrait of Mao, which can still be seen on today's 100-yuan bills. "Mao was too busy after the foundation of New China. You could not ask him to sit for a photo and listen to your directions, 'look this way, that way'," Chen says. In 1949, four photographers were commissioned to take photos of him, but the quality of the photos was not suitable for large-scale circulation because of their poor equipment and technique. "Our only option was to select one from group photos." The tools Chen used in those times were quite primitive. "I used sharpened clockwork springs and doctors' scalpels to scrape photos," he recalls. Other tricks included using special paints, brushes, pens and chemicals for photo or negative film processing. The second official photo was also derived from a group photo and was repaired and retouched. "The only shortcoming was I retouched them so well the hair looked a little fake," Chen says. The third official photo was processed at the end of September, 1959, after two photographers had been dispatched to take pictures of Mao - but again the pictures were considered unsatisfactory. Nevertheless, Chen chose one and began working on it, drawing in "heavy shades, creases on the coats and even a lampshade visible in the background". The fourth and final official portrait photograph was shot in 1964 and is the reproduction currently on show in Tian'anmen Square. The photographer's photos were shot in bad light, Chen says. "The heavy shading on the nose made Mao look aged and tired. They gave me the photos without saying a word. I didn't say anything, and shut myself in the dark room for a week.